CASology: Week 74: Weekly Winners! 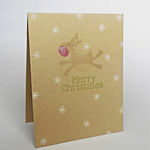 The two toned embossing on Kara's vellum card front is just simply gorgeous! 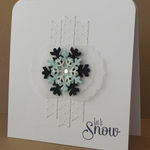 Beautiful movement of the snowflakes with just the right amount of bling. 1. 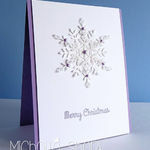 Judy's Choice: Michelle's delicate snowflake and soft lilac shades made this card a stand-out! 3. Meghan's Choice - Marisa's kraft, white and pink colour combination stole my heart! 4. Maureen's Choice: Greta's layered felt snowflake stole my heart! 5. Rosemary's choice: I love the way Becca mixed different elements to create her fabulous CAS design! 6. 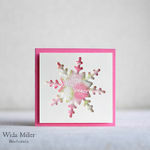 Kimberly's Choice: Wida's card made me gasp at the sparkle! Congrats Wida! 7. 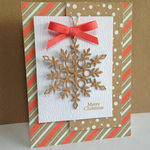 Ardyth's Choice - Lindsey's one-layer card is whimsical, rustic and FUN! 8. 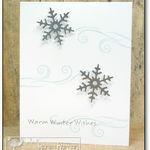 Melissa's Choice: I love all the movement, dimension & white space on Karen's pretty winter card! Be sure to stop back tomorrow morning for Challenge #75! Thank you for the honor, Maureen! Congrats to everyone--great assortment of cards! 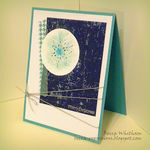 Thank you, Melissa, for selecting my card as an honorable mention! yeah thanks! and all the winners and players did an amazing job!